Added sharmind 5E D&D stats. Finish Halflings. Compiled info from various sources, added some of my own, and added an Ability Score bonus to them. Added: halfling, dray, shardmind, thri-kreen. Most of these just have info transferred from other Dark Sun site. I have a lot of details to fill in, inc 5E D&D stats for most. The minor races dwell on the fringes of the Tyr region settlements or are mostly found out in the wastes. Small tribes may often visit the settlements, such as a dray, but more than likely members of minor races are an oddity in places of civilization. 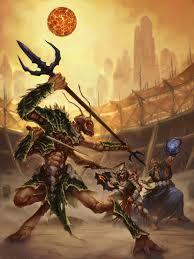 Information for roleplaying this race in Dark Sun: D&D 4E Dark Sun Campaign Setting p24. Try to hit on 2-4 main points that best represent the race and give them catchy headings. These can inc notes on appearance, culture, common personality traits/quirks, outlook, likes/dislikes, what they are good at, where they live, myths, religion, what might lead them to adventure, where they fit into society, etc. How they age. Height ; Weight ; Eye colour ; Hair ; etc. Typical alignment. Common personality traits (like 4E) or see 3E MCAU for 'Outlook'. Sorcerer/Spellscale (defiler); Mercenary; Warrior/Fighter/Clan Blade; Slaver; Smuggler; Deal broker/Money lender/Speculator; Elemental priest; Gladiator; Primal or site protector; Templar; Nomad; Wilder. State main language spoken. Types of names. Example names. Tight-knit clans live in isolated towers, citadels and ruins scattered throughout the Tyr region. Some clans have also struck deals with the sorcerer-kings for licenses to practice both magic and slave trading. State which type they follow and individual gods if common. Not done yet - deciding whether to go with dragonborn? Ability that starts at d8: Athletics. Wild Card dray also begin with a d8 in one other ability from the following choices: Survival, Vigor, or Will. Double the Advancement cost at character creation to raise: Agility, Technical, Vehicle Op or Warfare or any of their Specialties at character creation. (This does not affect Advances after character creation). Languages: Auto start with d8 in Common & Draconic. Other languages must be purchased as separate Abilities. Talent Tree Access: You gain free access to the Draconic and Acid, Cold, Fire or Storm TTs. (Your 'choice' TT must match the energy of your breath weapon - see below). (Language): Dwarven, Elven, Giant Can also improve Common or Draconic. Dragon Breath: As an action, place a Small Burst Template adjacent to you and make a Vigor (Resilience) roll. All targets in the area must make opposed Agility (Dodge) rolls or take 2d6 damage. At creation, the dray must decide what type of energy this attack deals: acid, cold, fire, or lightning. Presence: Advantage to Coercion (Intimidate) and Persuasion (Convince) checks. Dray have a commanding presence and strong force of drive and ambition. Scaled Hide: +1 Armor (which equates to +1 Toughness). Dray are covered in scales. Dedicated: Must spend at least 5 of their starting Advances on Specialties. Dray are natural perfectionists and tend to have fewer skills, but what they do, they do well. Greedy Hindrance: (Minor). Dray are avaricious and bargain fiercely. Loyal Hindrance: Dray will do anything to help members of their own clan and have a lot of pride. This becomes Vengeful Hindrance (Minor or Major) if another group takes hostile actions against the clan. Outsider Hindrance: -2 Persuasion with non-dray. Few people trust, and many fear, these lone clannish folk, especially as they are known slave traders and sorcerers. Dray face suspicion wherever they go. Information for roleplaying this race in Dark Sun: D&D 4E Dark Sun Campaign Setting p28; D&D 2E Dark Sun Boxed Set Rules Book p11. Halflings live apart from other races, divided by their stature and odd customs, but no one can deny their bravery and cunning. (4E D&D Dark Sun Campaign Setting p28). Halflings possess a great deal of racial unity. Though divided politically into separate villages and communities, halflings have great respect for their race as a whole. Political differences between them are settled wherever possible peaceably, through ritual and custom, most often under the direction of their spiritual leaders. (D&D 2E Dark Sun Boxed Set Rules Book p11). Halfling culture is fabulously diverse, but difficult for other races to comprehend. A complete history of their culture, if such a thing existed, would speak volume of complex social change, inspirational spiritual leaders, and in-depth personal studies of the halfling and his duty to his jungle home. Conspicuous in their absence would be references to great wars of conquest or tremendous monetary wealth - the yardsticks by which other races measure cultural success. Halfling culture cares for the individual's inward being, his identity and spiritual unity with his race and environment. Their culture does not provide for more traditional values, and vices such as greed and avarice are particularly discouraged. (D&D 2E Dark Sun Boxed Set Rules Book p12). Natives of the rain-kissed Forest Ridge, halflings are tribal people who maintain their distance from other humanoid races of Athas. They interact little with the Seven Cities or the people of the desert and are notorious for eating captured enemies. They're not above stealing livestock or ambushing unwary travellers to remedy an empty cook pot. Most halfings want nothing to do with outsiders, though. They defend their home with poisoned darts and primal magic. (D&D 4E Dark Sun Creature Catalog p60). The savagery for which they are feared masks a deep and abiding reverence for the natural world and an uncommon connection to the land's spirits. The halflings are an ancient people; according to the myths, they are among the oldest in the world. Once stewards of all the land, the halflings retreated when dark amgic came to power, and they built a civilisation on top of the world. Over the ages they have forgotten much of their learning, but they remain a spiritual people, and their connections to the natural world are the strongest of any civilized race in the Tyr Region. These connections make it hard for them to establish productive relationships with other races. (4E D&D Dark Sun Campaign Setting p28). The richness of the land may be disturbed an examined, even for a halfling's own gain. However, those riches belong to the land and, in the mind of a halfling, should never be moved away. For instance, nature intended a spring to bring water only to a certain area. To move the water through irrigation to some other area is not what nature had in mind. Similarly, an archeaelogical find in the jungle that yields a great pile of gold and metals is an event that shouldn't be tampered with - the gold might be used to raise a spectacular series of clerical buildings on the spot, but should not be carted off to some other location. (D&D 2E Dark Sun Boxed Set Rules Book p12). A halfling is very short, standing no more than 3 1/2 feet in height. They are muscled and proportioned like humans, but they have the faces of wise and beautiful children. A halfling weighs around 50 pounds and is virtually always in peak physical condition. (D&D 2E Dark Sun Boxed Set Rules Book p11). 2' 10" +2d4 45 lb. x 1 lb. Although halflings distrust other intelligent humanoids they often take forest (or desert) creatures as pets and companions. They are even known to work with larger and more intelligent creatures such as kirres, drakes and griffons. Pet panthers, giant lizards, etc are common. Each halfling is merely part of the overall race, which itself is part of a much larger organism - the world. This view makes it nearly impossible for halflings to deceive or betray one another. (4E D&D Dark Sun Campaign Setting p28). On a personal level, halflings relate very well to one another, well enough to have built a considerable culture rich in art, song, and other expressive communication. However, they tend to rely heavily on their culture for communication, a culture that both parties in a conversation are assumed to understand. It is difficult for a halfling to compensate in conversation for a listener who isn't intimately familiar with halfling culture, and as such they easily become frustrated with outsiders. Depending upon how 'official' a meeting is, outsiders often have to take great pains to learn local customs merely to communicate with the halflings in question. (D&D 2E Dark Sun Boxed Set Rules Book p12). Though they rarely deal with outsiders, halflings have been known to work with others for mutual gain. However, anyone who breaks an oath to a halfling tribe will find himself or herself quickly pursued by a band of headhunters. These marauders pose a threat to any traveller who wanders into their hunting grounds. (D&D 4E Dark Sun Creature Catalog p60). 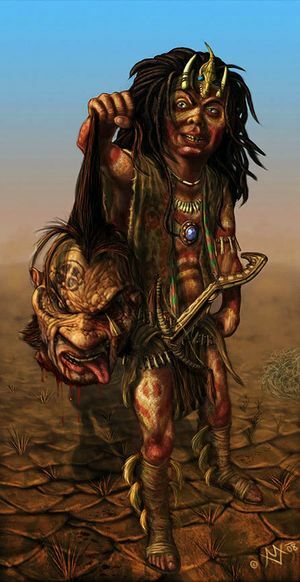 Halflings are well known as cannibals. Halflings see all creatures as potential sources of sustenance. After all, living beings compete to survive, and halflings think nothing of eating their enemies, for doing so ensures their own survival. (4E D&D Dark Sun Campaign Setting p28). Halflings feel they are misunderstood; that they are so much more than savages. In fact, their world view and view of the way the other races, contradicts what others think of them. A typical halfling struggles being called a savage when he sees other races use resources to enslave and manipulate others, defile the land with arcane magic, and build large cities ruled by tyrants. But rather than mock the cultures of others, halflings are open-minded and their curiosity leads them to try to understand the way others live. For a halfling that has ventured beyond the Forest Ridge it is very important for a halfling to understand the customs of their new allies, to the point of adopting these customs. Such knowledge is seen as a great accomplishment among the halflings and information on the customs of other races is valued should a halfling return to his home. Hunter/forest runner/headhunter; witch doctor/shaman/forest keeper; explorer; slave; mercenary; raider; barbarian; primal warden; exile; curious wanderer; seeker of knowledge; wilder, nature's protector. Starting Languages: Common and Halfling. Names. Similar to standard halflings, though tribal names that refer to their jungle home instead of family names. Halflings hail from The Forest Ridge, a mysterious and legendary jungle said to crown the Ringing Mountains. Those found in the tablelands are typically lone wanderers, though some are slaves, mercenaries or raiders. It matters not where a halflings are currently living, they all consider the Forest Ridge their home. Halflings are very spiritual, Druids and nature clerics are often tribal leaders or at least advisers to those leaders. Halflings revere the world almost like a deity or living being. They do the same for areas of natural beauty from as large as the Forest Ridge to a small spring. The line between spirits dwelling in these place and the place itself being sentient is blurred and confusing to outsiders, but typically this just varies slightly from tribe to tribe. Poison Resistance. You have advantage on saving throws against poison and you have resistance to poison damage. Wild Talent. You know one random cantrip from a spell list of your choice. This cantrip cannot be one that deals damage. You do not need any components to cast this spell and Charisma is your spellcasting ability for it. Halflings of the Dark Sun setting typically have latent psionic ability. Fleet of Foot. Your base walking speed increases to 30 feet. Dark Sun halflings are free to choose this too if they do not wish to be Wild Talents. Weak (Minor). All halflings are small which limits their physical strength. Curious (Minor): Jungle halflings are intrigued by other cultures and like to learn why others act the way they do. A wide variety of experience is encouraged by the teachings of the tribal witch doctors. Outsider (Minor). Jungle halflings possess a great deal of racial unity, but have trouble communicating with other cultures. Other races, that have heard of the halflings' strange customs (notably cannibalism) are also reluctant to get too close to these little guys from a strange land. Loyal (Minor). Applies the jungle halfling subrace as a whole. Jungle halfling culture is very unified. Primitive (Minor). This is typical for all races of Dark Sun, where metal is very rare. Illiterate (Minor). Jungle halflings do not communicate with the written word. Bonus Proficiencies. For each minor drawback assigned to a jungle halfling, you select one of the following: Acrobatics, Endurance, Nature, Stealth, Survival, Blowguns (Simple + Martial), Brawling weapons (Simple + Martial), Spears (Simple), Thrown & Slings (Simple + Martial) or herbalism kit. Ability that starts at d8: Agility. Wild Card halflings also begin with a d8 in one other ability from the following choices: Stealth, Survival, or Will. Double the Advancement cost at character creation to raise: Athletics, Persuasion, Technical, Vehicle Operation or any of their Specialties at character creation. (This does not affect Advances after character creation). Languages: Auto start with d8 in Common. Other languages must be purchased as separate Abilities. Talent Tree Access: You gain free access to the Mental Toughness, Plant/Green Bond and Small Talent Trees. Brave/Courageous Edge: +2 to Will (Spirit) checks vs fear and intimidation. Can also reduce the results of each die on the Fear/Mental trauma Critical Chart for fear effects. Fortunate: 1 extra Benny per session. 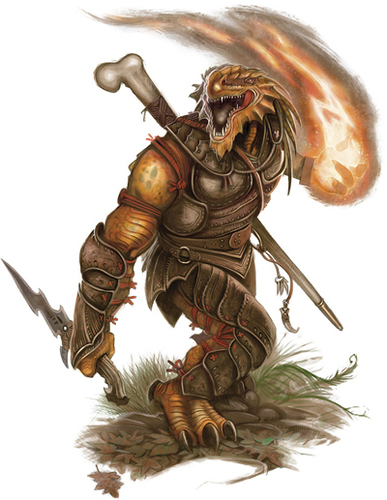 Can also use Bennies to make enemies reroll any attack or ability that would affect the halfling. * Poison Resistance: Advantage on Vigor (Resilience) rolls vs poisons. Small Frame: Can swap the Specialties of Climb and Swim from Athletics to Agility. Like a lot of small beings, halflings' bulk is not a factor for some athletic tasks. Spirited: Advantage on Will (Spirit) rolls to resist fear and Intimidate. Halflings have a lot of verve and are known for their fearlessness. Curious Hindrance: Halflings are intrigued by other cultures and like to learn why others act the way they do. A wide variety of experience is encouraged by the teachings of the tribal witch doctors. Loyal Hindrance: (Minor) This applies the halfling race as a whole. Halfling culture is very unified. Outsider Hindrance: -2 Persuasion when dealing with non-halflings. Halflings possess a great deal of racial unity, but have trouble communicating with other cultures. Other races, that have heard of the halflings' strange customs (notably cannibalism) are also reluctant to get too close to these little guys from a strange land. Primitive: Start with a d4 in Technical and Vehicle Operation abilities. All starting weapons are made from primitive materials (and gain the Fragile 1 quality). Also begin with the Illiterate hindrance. Size -1: Size penalty is subtracted from: Pace, Toughness, and Athletics die before determining Encumbrance. Being only about four foot tall, halflings move slower and are less sturdy. Shardminds are psionic creatures formed from physical and psychic crystals. Their description is from the Dungeons & Dragons 4th Edition Player's Handbook 3. Psion; Mystic; Wasteland warrior; Wilder; Guardian. 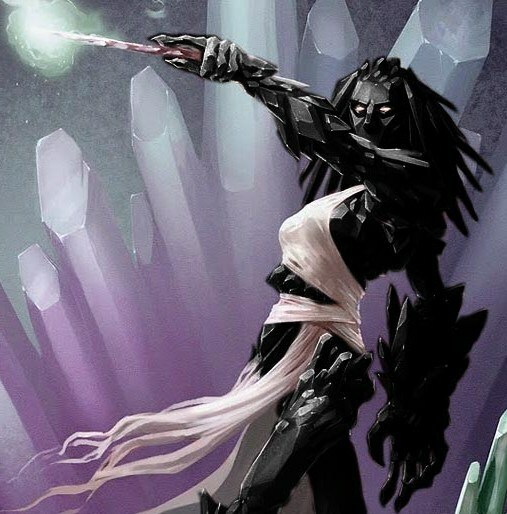 The black shardminds (Obsidians) are predominantly from the south of the Tyr region. In particular they live under the obsidian plains known as The Dead Lands. Red shardminds are typically from the north on the Try Region (an area known as the Jagged Cliffs region). Expressionless: Those interacting with a shardminds, have disadvantage on Wisdom (Insight) checks. Not having facial expressions makes it hard for others to read you. Languages. Common, Deep Speech and 1 other of your choice. Living Construct: Shardminds do not need to eat, drink, breathe, or sleep. They never make checks to resist starvation, thirst, or suffocation. They have advantage on saving throws versus poisons and are immune to disease. Medicine checks are made at disadvantage on shardminds, and even when a healing kit is used, a Medicine roll (at disadvantage) must be rolled for the shardmind to stabilise. Someone can alternatively make a repair roll using Intelligence. (Proficiency with mason's or gem cutter's tools can be added) or use the mending cantrip (which functions as spare the dying) on a shardminds. Self-Stabilising. You have advantage on all death saving throws. Telepathy: Shardminds can communicate telepathically with any creature within 30ft that has a language. Unsleeping Watcher: Shardminds do not sleep, but enter a state of inactivity for 4 hours to gain the benefits of a long rest. While in this state, they are fully aware of their surroundings and can make Wisdom (Perception) checks as normal. Speed. Base speed is 30 feet. Fragile (Minor): Sonic and thunder attacks really rattle your crystaline make-up. Moving Crystals (Minor Racial): You have disadvantage on Dexterity (Stealth) checks. Shardminds are made up of many individual crystals that are in constant movement, and hence, make constant grinding and tinkling sounds. (If 'bought off', this represents a shardmind that has learnt to 'separate' when stealth is needed). Socially Inept (Minor). Shardminds do not have expressions and are generally hard for others to relate to. Bonus Proficiencies. For each minor drawback assigned to a shardmind, you select one of the following: Arcana, Endurance, History, Insight, or Investigation or one relevant language. There are no subraces for the generic shardmind race, though for some settings you may wish to create some, such as having different coloured shardmind with their own traits based upon the supposed properties of the relevant gem compositions. Ability that starts at d8: Smarts. Wild Card shardminds also begin with a d8 in one other ability from the following choices: Coercion, Knowledge, Persuasion or Will. Double the Advancement cost at character creation to raise: Animal Training, Status, Stealth, and Survival or any of their Specialties at character creation. (This does not affect Advances after character creation). Languages: Auto start with d8 in Common & Deep Speech. (Or whatever language is common to aberrations in the campaign). Other languages must be purchased as separate Abilities. Talent Tree Access: You gain free access to the Construct/Droid and Psionic Talent Trees. Crystaline Mind: +2 Sanity. Shardminds' 'minds' are stronger and operate very differently than living beings. Expressionless: Those interacting with a shardmind suffer -2 to Perception (Insight) checks. Not having facial expressions makes it hard for others to read shardminds. Immortal Origin: Being from the Astral Sea, shardminds are considered Immortal creatures for the purpose of creature origin. Living Construct: Shardminds do not need to eat, drink, breathe, or sleep. They never make checks to resist starvation, thirst, or suffocation. They are not affected by standard poisons or disease. They receive a +2 to remove the Shaken condition and gain a +1 bonus to Soak Wound and Soak Madness rolls. Furthermore, shardminds cannot be healed (though magical healing works normally). Instead they need to be repaired using the Technical (Constructs) ability. Telepathy: Shardminds can communicate telepathically with any creature within 6" that has a language. Unsleeping Watcher: Shardminds do not sleep, but enter a state of inactivity for 6 hours to gain the benefits of an extended rest. While in this state, they are fully aware of their surroundings and can make Perception (Notice) rolls as normal. Intolerant Hindrance: (Major vs Aberrations). It is possible shardminds were created with the direct purpose of fighting aberrations. Living Construct: Normal healing and natural healing have no effect on a shardmind. Moving Crystals: Disadvantage on Stealth (Sneak) checks. Shardminds are made up of many individual crystals that are in constant movement, and hence, make constant grinding and tinkling sounds. (This can be 'bought off' with an Advance, as a shardmind learns to 'separate' when stealth is needed). Uneasy Appearance: -2 to all Persuasion checks with living creatures. Shardminds do not have expressions and 'rocks that communicate' can be a little unnerving for some. Information for roleplaying this race in Dark Sun: D&D 4E Dark Sun Campaign Setting p23; D&D 2E Dark Sun Boxed Set Rules Book p15. Hunter/predator; Last clutchmate/loner; Explorer; Scout; Wilder; Follower of The Great One; Elemental priest/shaman/druid; Primal guardian. Thri-kreen are people of the deep desert. Most are nomads from the Western Hinterlands and have little experience in cities, but some come from large packs of raiders that plague the Ivory Triangle and the Tablelands. haven't done 5E kreen yet. Ability that starts at d8: Agility. Wild Card kreen also begin with a d8 in one other ability from the following choices: Athletics, Perception, Stealth, or Survival. Double the Advancement cost at character creation to raise: Deception, Gaming, Perform, Persuasion, Status, Technical and Vehicle Operation or any of their Specialties at character creation. (This does not affect Advances after character creation). Languages: Auto start with d8 in Thri-Kreen. Other languages must be purchased as separate Abilities. Talent Tree Access: You gain free access to the Endurance and Wilderness Talent Trees. (Language): Any enemy or ally, inc Common. Alien Mind: +2 Sanity. Kreen rarely suffer from typical mental conditions common to other races. Armored: +1 Armor (which equates to +1 Toughness). All kreen are covered in hard chitin. Claws: Athletics +1d4 slashing damage. As a natural fighter, a kreen is never considered unarmed. Kreen arms end in claws that can be used as natural weapons. Low Light Vision: Insectoid eyes allow kreen to ignore attack penalties for Dim and Dark lighting. Multiple Arms: Gain the Quick Draw and Ambidextrous edges for free. (Although they do not begin with it, each time a kreen takes the Two-Weapon Wielder edge they can make an extra attack, up to a maximum of 4). Having 4 upper appendages allows kreen to attempt several things in round. Natural Jumper: Jump specialty die may exceed Athletics die. Each raise on a Jump check adds a further 1" to the distance jumped. Make all Jump rolls as if the kreen had a running start, and gain Advantage if actually taking the run action. Torpor: Kreen do not sleep, but enter a torpid state of inactivity for 4 hours to gain the benefits of an extended rest. While in this state, they are fully aware of their surroundings and can make Perception (Notice) rolls as normal. Alien Mind: -2 to all Persuasion checks with all creatures outside their clutch (including other kreen). Close friends can become new clutch mates. (See "Duties of a Clutchmate", D&D 4E Dark Sun Campaign Setting p23). Kreen minds are pragmatic and survival-tuned to the extreme. Intro paragraph. Very general statements that summarises the race. List common archetypes and actual classes backgrounds and subclasses for D&D. List lands where they are found in this setting.